Decades of research support dairy products’ role in a healthful diet. The 2010 Dietary Guidelines for Americans recommend consuming three daily servings of low-fat and fat-free milk and milk products, such as yogurt and cheese, to help close the gap on three of the four nutrients of public health concern: calcium, potassium, and vitamin D.1 In addition, the Academy of Nutrition and Dietetics, the American Heart Association (AHA), and the DASH diet program all make the same recommendation. 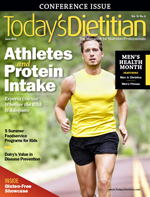 This article will discuss recent evidence of dairy’s health benefits and its value in disease prevention and provide strategies to help clients and patients close the nutrient intake gap and overcome barriers to including dairy in their diets. Milk, yogurt, cheese, and other dairy products provide calcium, potassium, and vitamin D to the diet. According to the Dietary Guidelines evidence rating, moderate evidence shows that milk and milk product intake is linked to improved bone health, especially in children and adolescents.1 Moderate evidence also shows that milk and milk product intake is associated with a reduced risk of cardiovascular disease and type 2 diabetes and lower blood pressure in adults.1 The Dietary Guidelines specifically call for an increased intake of low-fat and fat-free milk and milk products as a vehicle to close the nutrient intake gap for calcium, potassium, and vitamin D.
“Based on the evidence I’ve seen, there’s no need to acquire dairy products in general or on MyPlate,” says Susan Levin, MS, RD, director of nutrition education for the Physicians Committee for Responsible Medicine in Washington, D.C., who believes a plant-based diet is a healthier way to meet calcium, potassium, and vitamin D requirements. However, this may be easier said than done for many people. The Adequate Intake for potassium for adults is 4,700 mg/day. However, in the United States, the consumption of fruits and vegetables, which are high in potassium, is lower than recommended. As a result, dietary intake of potassium is low and, as mentioned, is one of the nutrients of concern in the Dietary Guidelines. “It’s nearly impossible to meet the potassium recommendations without that third serving of dairy,” says Keith-Thomas Ayoob, EdD, RD, FAND, an associate clinical professor in the department of pediatrics at Albert Einstein College of Medicine in the Bronx, New York. Despite the disagreement over the Dietary Guidelines’ dairy recommendations, the preponderance of evidence continues to support the benefit of dairy as part of a healthful diet and its value in disease prevention and other chronic conditions. New data are emerging that suggest the delayed introduction of allergenic foods may increase the risk of food allergies, and early introduction of highly allergenic foods actually may reduce the risk.5 “The theory behind early introduction is to gradually acclimate the body so that it’s less likely to be recognized as an allergen,” Ayoob says. “There’s also some evidence for pregnant women to eat common allergens while pregnant so as to help the infant ward off allergens after birth, but this is in the hypothesis stage and more research is needed,” Ayoob says. According to the AAP, current evidence supports the general notion that highly allergenic foods may be introduced earlier in the diet as complementary foods. However, whether the early introduction of highly allergenic foods proves to prevent food allergies remains unanswered. Intervention studies must be performed to support the data from observational studies. In the WCRF/AICR Continuous Update Project’s October 2011 review of current scientific evidence, the panel concluded that the new evidence didn’t warrant a change in its initial judgment, as it was consistent with the 2007 evidence, showing that milk probably protects against colorectal cancer. In addition, the panel conducted a meta-analysis that found increased milk intake was associated with a decreased risk of colorectal cancer in eight of 10 new cohort studies. The meta-analysis also showed that increasing dietary calcium by 200 mg/day lowered risk of colorectal cancer by 6%. The panel added that any effect of milk consumption on reducing colorectal cancer risk may be explained at least in part by increased calcium. After a 2011 review, the WCRF/AICR panel stated that there’s substantial and consistent evidence from both cohort and case-control studies that a dose-response relationship exists, and diets high in calcium are a probable cause of prostate cancer. The AICR advises consuming no more than 1,500 mg of calcium from diet and supplements daily. The benefits of dairy in bone health are well-known. The 2010 Dietary Guidelines, the Institute of Medicine, and the AAP all recognize the importance of dairy foods for bone health, especially in children and adolescents. However, recent evidence suggests not all dairy products are equally beneficial. A February 2013 study published online in the Archives of Osteoporosis found that dairy intake, specifically milk and yogurt, is associated with higher bone mineral density in the hip but not in the spine. Researchers reviewed data collected from food-frequency questionnaires completed by 3,212 participants from the Framingham Offspring study. Participants’ dairy intake was compared with bone mineral density measurements, which revealed the benefits of milk and yogurt, while evidence suggested that cream may adversely influence bone mineral density.9 Choosing low-fat milk or yogurt over cream can increase intake of protein, calcium, and vitamin D, which contribute to normal bone maintenance. Other research has found that maintaining a healthy weight and eating a nutrient-dense diet can help prevent type 2 diabetes. “Though research isn’t conclusive, some suggest that dairy products can help prevent the disease,” says Jill Weisenberger, MS, RDN, CDE, author of Diabetes Weight Loss — Week by Week. An August 2013 meta-analysis published in the American Journal of Clinical Nutrition analyzed 17 studies with data from more than 370,000 men and women to determine the relationship between dairy intake and diabetes risk. Evidence suggests there’s a significant inverse association between the intake of dairy products, low-fat dairy products, and cheese and type 2 diabetes risk.11 “For nearly one extra daily glass [6.5 oz], milk drinkers had a 13% lower risk of type 2 diabetes,” Weisenberger says. • Eating 1 cup of low-fat yogurt or cottage cheese instead of a few handfuls of potato chips. • Mixing fresh fruit with low-fat cottage cheese. • Adding one glass of skim or low-fat milk to a meal instead of tea or a sugary soda. • Drinking a hot or iced nonfat latté instead of a high-calorie coffee drink. • Having an 8-oz cup of hot chocolate made with low-fat milk, cocoa powder, and sugar or a nonnutritive sweetener. • Adding tomatoes, fresh basil, and black pepper to low-fat cottage cheese for a low-carb snack. • Eating a reduced-fat cheese stick and a handful of raw veggies. A body of evidence is emerging that links milk and other dairy products to a reduced risk of heart disease, hypertension, obesity, and type 2 diabetes. Currently, there’s insufficient evidence to recommend milk restriction as a treatment for patients with acne. The AAP supports the early introduction of milk into the diet of infants as young as 4 months of age. Adequate calcium intake from diet and supplements is associated with a lower incidence of colorectal cancer. Conversely, too much calcium from diet and supplements is associated with an increased risk of prostate cancer. Calcium is necessary for bone health, and the AICR recommends nonfat and low-fat dairy products such as milk, yogurt, and cheese as part of a balanced diet for bone health and cancer prevention. — Constance Brown-Riggs, MSEd, RD, CDE, CDN, is the nutrition advisor for the Dannon One Yogurt Every Day Initiative; a past national spokesperson for the Academy of Nutrition and Dietetics, specializing in African American nutrition; and the author of The African American Guide to Living Well With Diabetes and Eating Soulfully and Healthfully With Diabetes. 3. Burris J, Rietkerk W, Woolf K. Acne: the role of medical nutrition therapy. J Acad Nutr Diet. 2013;113(3):416-430. 4. Is there a link between acne and milk products? Summary of evidence. Dairy Nutrition website. http://www.dairynutrition.ca/scientific-evidence/roles-on-certain-health-conditions/is-there-a-link-between-acne-and-milk-products-summary-of-evidence. Accessed April 4, 2014. 5. Fleischer DM, Spergel JM, Assa’ad AH, Pongracic JA. Primary prevention of allergic disease through nutritional interventions. J Allergy Clin Immunol Pract. 2013;1(1):29-36. 6. Katz Y, Rajuan N, Goldberg MR, et al. Early exposure to cow’s milk protein is protective against IgE-mediated cow’s milk protein allergy. J Allergy Clin Immunol. 2010;126(1):77-82. 7. Calcium and cancer prevention: strengths and limits of the evidence. National Cancer Institute website. http://www.cancer.gov/cancertopics/factsheet/prevention/calcium. Accessed April 4, 2014. 8. Giovannucci E, Rimm EB, Wolk A, et al. Calcium and fructose intake in relation to risk of prostate cancer. Cancer Res. 1998;58(3):442-447. 9. Sahni S, Tucker KL, Kiel DP, Quach L, Casey VA, Hannan MT. Milk and yogurt consumption are linked with higher bone mineral density but not with hip fracture: the Framingham Offspring Study. Arch Osteoporos. 2013;8(1-2). doi: 10.1007/s11657-013-0119-2. 10. Mozaffarian D, Hao T, Rimm EB, Willet WC, Hu FB. Changes in diet and lifestyle and long-term weight gain in women and men. N Engl J Med. 2011;364:2392-2404. 11. Aune D, Norat T, Romundstad P, Vatten LJ. Dairy products and the risk of type 2 diabetes: a systematic review and dose-response meta-analysis of cohort studies. Am J Clin Nutr. 2013;98(4):1066-1083. 12. O’Connor LM, Lentjes MA, Luben RN, Khaw KT, Wareham NJ, Forouhi NG. Dietary dairy product intake and incident type 2 diabetes: a prospective study using dietary data from a 7-day food diary. Diabetologia. 2014;57(5):909-917. 13. Knip M, Virtanen SM, Akerblom HK. Infant feeding and the risk of type 1 diabetes. Am J Clin Nutr. 2010;91(5)1506S-1513S. 14. Wang H, Livingston KA, Fox CS, Meigs JB, Jacques PF. Yogurt consumption is associated with better diet quality and metabolic profile in American men and women. Nutr Res. 2013;33(1):18-26.